What Exactly Is Slack Claiming? In reality, Slack only encrypts data in transit and at rest, which means the data may get decrypted at certain routing points in the cloud. In their EKM offering, Slack combines crypto objects with keys on public cloud servers when they process messages. This means the messages are visible in clear text during this process, rendering them vulnerable to hackers. Is this prioritizing security? We think not. At Symphony, security is core to our DNA. We invested on Day One to build our entire platform upon true end-to-end encryption, and offered Key Management from the get-go. This is why we have an unmatched encryption model that operates effectively without compromising usability, including in search and with bots. 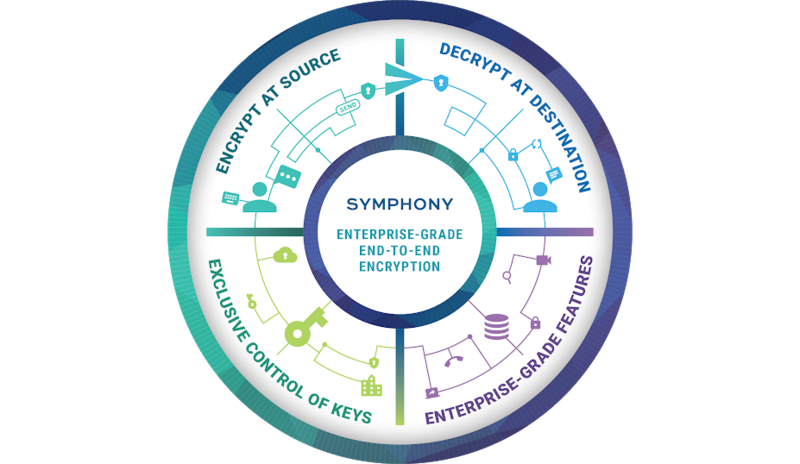 Symphony encrypts messages at the origin and does not decrypt until the messages reach the intended recipients, and we give you full physical and exclusive control of encryption keys with our Enterprise offering. This means that even if data falls into the hands of hackers, it remains encrypted and is safe. Our implementation of enterprise-grade end-to-end encryption, with zero gaps between the origin of a message and its destination, while still maintaining the ability for a company to access and archive its own data and perform all the required compliance controls in real time, is unique in the market today. It’s this encryption model that provides the core protection every enterprise should demand — and that every platform should prioritize. Watch our video, view our infographic, or download our white paper “As Collaboration Shifts to the Cloud, Security Requires a Rethink” — and see how our true end-to-end encryption model is unmatched. Please also feel free to reach out to the team at secure@symphony.com if you’d like to learn more about how Symphony can help your team collaborate securely.